At a place where the road ran close to the bayou we had a little critical experience. The rebs had some artillery in position on the opposite bank, and as our ambulances came along they opened out on them, one shot killing a span of mules for us. The column halted in an instant and after things were quietly investigated we moved on. The regiment arrived back at camp near Morganza, Louisiana, in the afternoon. 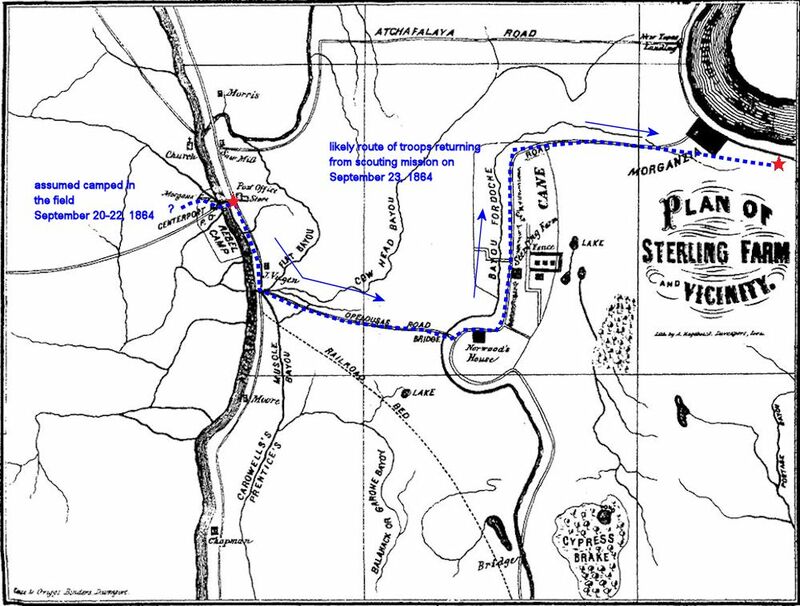 This period map shows the location of key landmarks at the Battle of Stirling Plantation (or Fordoche Bridge) which occurred, as mentioned above by Wolbach, on September 29, 1863. The 16th Ohio passed by this site on its way to the Atchafalaya River at Centerpoint while searching for Rebel troops. It is believed that Centerpoint is a short distance north of current day Melville, Louisiana.